The J Herbin 1670 Caroube de Chypre fountain pen ink is a dark brown color with light red reflections and sparkling gold flecks. 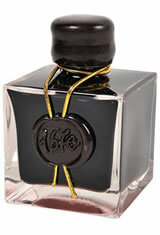 The J Herbin 1670 Caroube de Chypre Fountain Pen Ink usually ships within 1 business day unless otherwise specified. Each J Herbin 1670 Caroube de Chypre Fountain Pen Ink we sell is guaranteed to be genuine, authentic and will arrive brand new & unused! See my ravings on my Stormy Grey review. This is the newest color in the "anniversary" line of ink. The color is a very rich brown with hints of red and maybe a little green. As it dries, the "magic" begins to shine through! As you look down at the page you're writing on, you see the beautiful dark brown color and then there is a little sparkle coming through. But wait! There's more! Look at the page at a slight angle and all of your writings are a shimmer of solid gold! Very special ink for notes to very special people in your life.